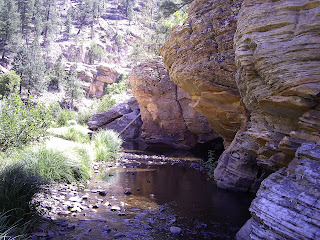 Our next short trip wil be over Labor Day weekend (September 4th to 7th) at Mt. Baldy RV Ranch just outside of Mt. Baldy Village, CA set at about 4500' elevation. 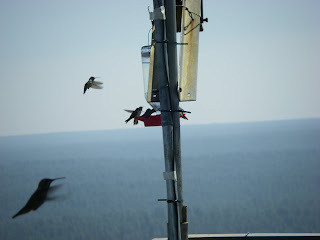 This little mountain park is located in the San Gabriel Mountains, about 21 miles from our home. Stay tuned for more details! After the success of our first mini-rally in Austin, TX this past April there was a lot of interest by those who attended to do something again soon.....not a year from then, but just 3 months from April. David and Denise Zonker already had reservations at Moutain View RV Resort in Creede, CO (located north of Durango in the San Juan Mountains), so we suggested that we all meet there August 3rd. We ended up with 10 Newell coaches at this rally ranging from the oldest (2 1982 coaches, including ours, to a 1996). These are some great people, and we had the opportunity to get to know many more people on a more personal level. We left home early on July 31st (5am) and stopped in Barstow, CA so Elaine could participate in 2 phone conferences. We departed Barstow around 11:30am with the temperatures already heading rapidly toward their high point for the day. We passed through Needles around 3pm and noted the temperature was over 112 degrees! Wow...we had the dash A/C and the roof A/C going just to keep it around 80 inside! We had to pull of I-40 a few times to let the 6V92 cool down a little. We arrived in Flagstaff, AZ around 6:30pm, and to temperatures in the 70's...we were now at 7,000' elevation...what a relief. We had a delightful dinner at the local Olive Garden, and then traveled one exit east to the Cracker Barrel Restaurant where we would spend the night in their RV parking located behind the restaurant, which blocked the freeway sound quite adequately! The next morning, August 1st, we ate breakfast at the Cracker Barrel and then headed up HWY 89 to HWY 160, which would ultimately take us to the delightful Colorado town of Cortez....located about 8 miles west of Mesa Verde National Park (home of the famous indian cliff dwellings). We left Cortez, CO the next morning around 10am, and moved 9 miles over to Mesa Verde RV Resort, and then spent the rest of the day with Steve and Tricia Ward (also own a 1982 Newell 38' Coach) exploring Mesa Verde National Park.....what a blast we had! It was quite hot, so upon arriving back at the RV park late in the day we headed directly to the swiming pool where we spent an hour cooling down before having dinner. The next morning, August 3rd, we left around 7am to get to Wolf Creek Pass early in the day to aovid the heat....the pass tops out at 11,500' elevation, and on the west to east approach the grades exceeded 7%....it was a grinding 8 mile climb, but we got over without much trouble, and down to South Fork, CO where we changed to HWY 149 to head up to Creede, about 25 miles north of South Fork. 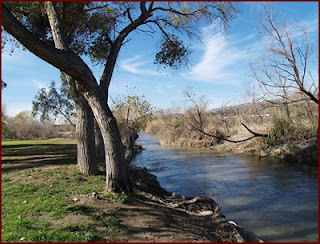 We arrived at Mountain Views RV Resort around 1pm, and got set up and then just sat on the edge of the Rio Grande River (yes THE Rio Grande) enjoying the view, and the quiet. Later that evening we went to dinner in town with David and Denise Zonker at Kip's Grill...they have GREAT fish tacos, and spent several hours talking. The next morning I went mountain biking with Richard Entriken who is about 8 years my junior. We did a 16 mile ride climbing up to over 10, 500' before a quick descent back through Creede to the RV park. That evening we had a pot luck (the first of a couple). On Thursday we took a 20 mile rountrip bike ride (with David and Denise) down HWY 149 to the second bridge crossing of the Rio Grande, stopping in town on the way back for some great ice cream. We stayed busy each day touring the other 9 coaches, eating some great gumbo (thank you Connie Russo for your hospitality and the great gumbo!). 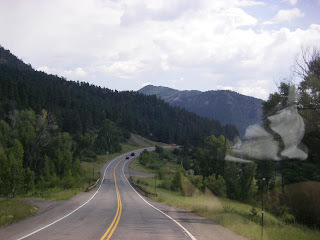 We spent 5 days at Creede, CO, and then departed for our trip home on August 7th. We hooked up with Tom and Darlene McCloud who had talked us into driving down to their cabin south of Flagstaff, AZ that day....about 465 miles....longer than I like to drive in one day, but we were so glad we did. We spent Saturday touring around the mountain community near their cabin, and then rode their quads all over the "back 40" exploring the forest around their home. "It's a girl, my Lord, in a flat bed Ford, slowing down to take a look at me...." Elaine and I at the famous corner in Winslow, AZ! Later that day around 6pm we parted ways with Tom and Darlene, who would continue on south to their home in Mesa, AZ while we headed north to Flagstaff, and then west on I-40 to Ontario, CA, our home. We drove to Kingman, AZ where we fueled up, then then, once again, spent the night behind the local Cracker Barrel leaving around 3am for home...we got home around 9am and spent the rest of the day leisurely unloading the coach. What a great 10 days we had on the road getting a small glimpse our our life in just a couple of years when we head out for months at a time! 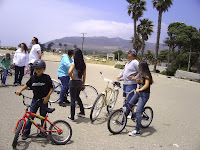 For the second year in a row we traveled in our Newell with other family members up to Ventura, CA to spend Memorial Day weekend at Ventura RV Park on the north side of the town of Ventura. This park is right next to Highway 101 on the east side of the highway. There is a lot of freeway noise, but the park is nice, and walking and/or biking distance from their "Old Town" area. We ended up with 5 families (my son Chris and his family, Chris' inlaws, Ed and Linda, Bea and Michael and kids (Chris' sister-in-law and brother-in-law) and Yvette and her kids (another sister-in-law). The Lakers were in the midst of their championship run at Denver, so a couple of evenings were spent around the outside TV watching with agony as the Lakers won once, and lost once. 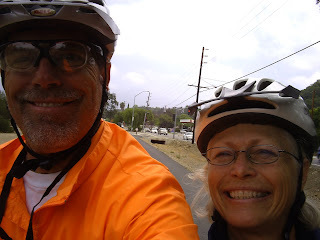 Elaine and I took a bike ride on the Ojai River Trail up to Ojai and back (around 24 miles round trip) one morning for breakfast. 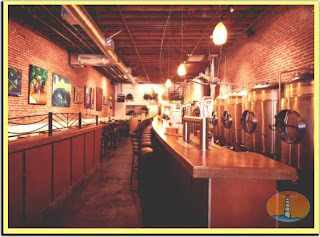 We went to lunch on Friday with Ed and Linda at Anacapa Brewing Company (ABC) in downtown Ventura. 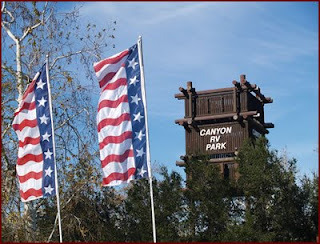 Our next short Newell trip was over the 4th of July weekend when we traveled all the way to Canyon RV Park along the Santa Ana River near Yorba Linda, CA....almost 15 miles from our home....LOL!! This was also the 2nd year in a row that the same 5 families made this trip. It wasn't quite as hot as last year.